We were called in by the church to carry out some belfry maintenance. The following were the the main items we were asked to deal with. 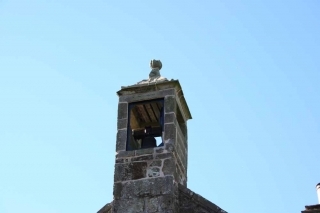 The topmost stone on the belfry had been badly cracked and destabilised by the expansion of the rusting iron dowel inside it. As there is a public walkway underneath the belfry, this had to be treated as a priority. 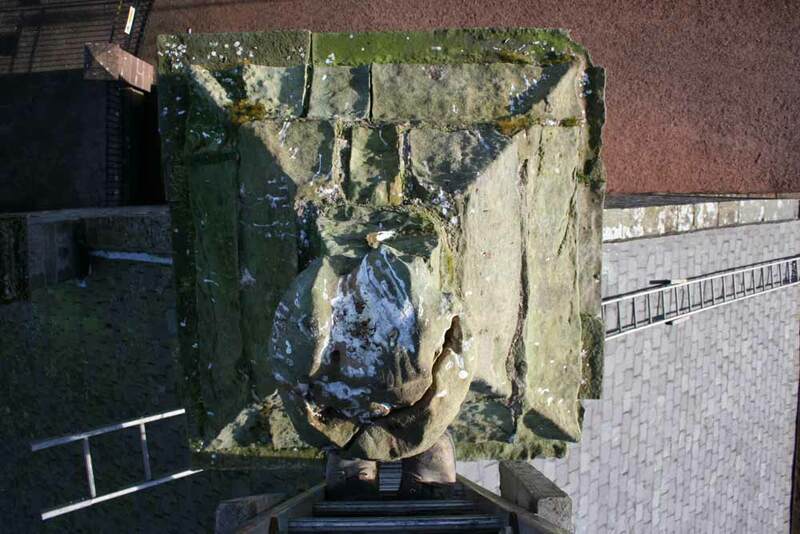 It was felt that the main body of the belfry needed lateral stabilisation. 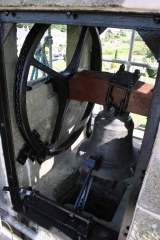 The bell wheel was very loosely fixed. This picture was taken during our initial inspection. 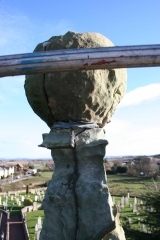 The huge crack across the top of the ball can be clearly seen. Here you can see that the dowel has also shattered the top of the stone on which the ball is mounted. Full replacement of both of these stones was discussed, but we strongly felt that this attractive old belfry, with these stones which have gained a unique shape due to years of weathering, would lose a lot of its character if we fitted brand new, perfectly shaped stones. Therefore, everything was repaired. 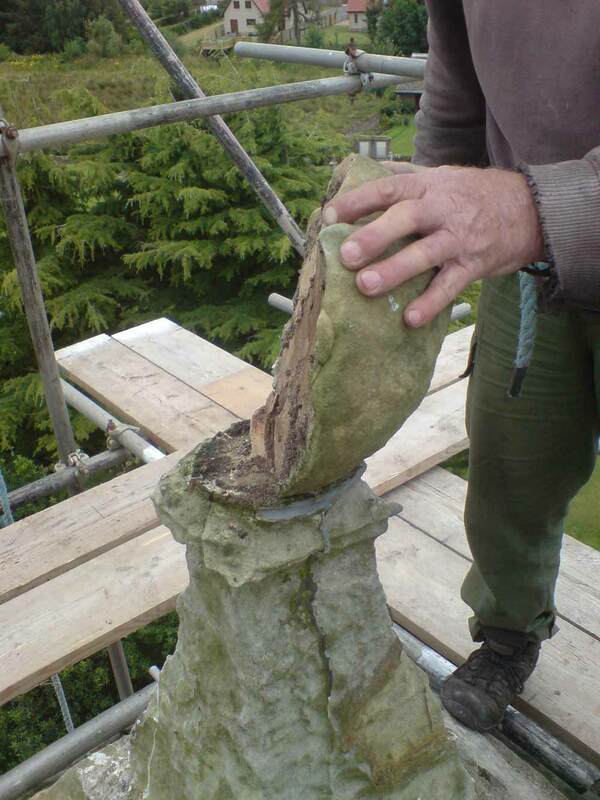 The only loss was the fact that we had to cut about 4 inches (the damaged part) off the top of the “pillar” stone. 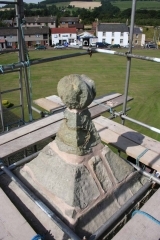 Preparing to rebuild the top two stones. The heavy copper dowel you see here drops right down through this stone and about 6 inches into the stone below. 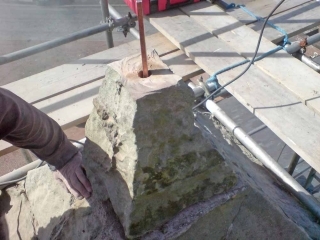 After we laid this stone on its lime mortar bed, we injected polyester resin into the hole, and then pressed the dowel down into it. The ball and the pillar stone are very securely fixed to the large, wide-based, and heavy stone on which they sit. These stones had never blown off in the past anyway, but there is absolutely no chance of that happening now. 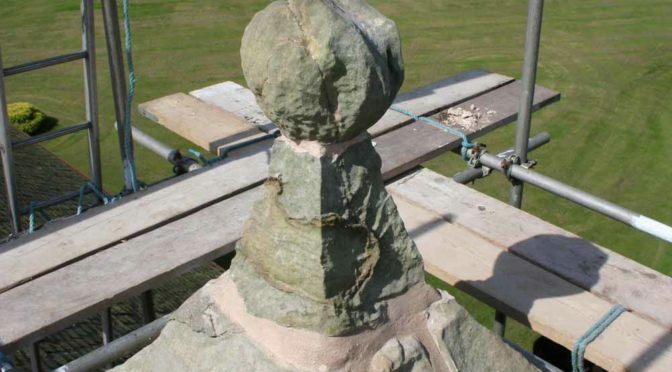 The ball was repaired using polyester resin and copper dowels. 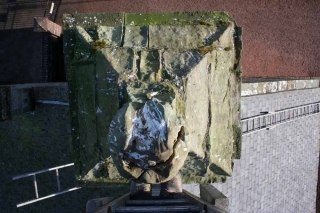 The resin “sticks” the stone back together, but the dowels stitch across the cracks and make it impossible for the sections to seperate again. The ball contains two of these dowels. 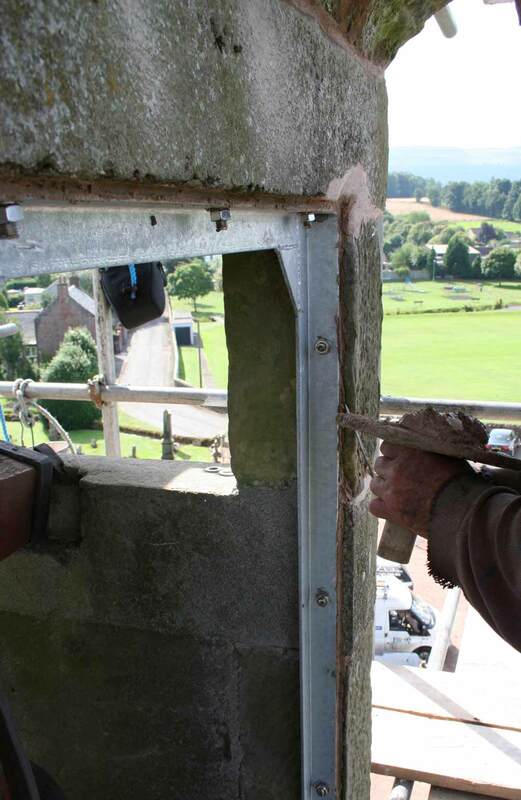 These frames were fitted, at the church’s request, to give the belfry some lateral stability. Two were installed. They are made from galvanised mild steel, and the bolts are stainless steel (to prevent future damage to the masonry) anchored into polyester resin. One of the frames, fully installed, painted and pointed. 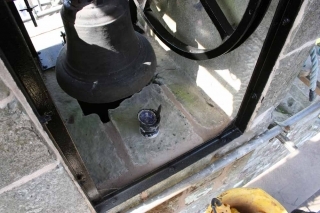 New galvanised clamp fitted to bell wheel to stop any movement. We also painted the timber “headstock” with Butinox, and all metalwork has been glossed.